The Imperial world of Aurora Primus was thought lost to imperial scholars; hushed whispers and rumours spoke of a dark past as far back as the fall of the Eldar Empire. It is the 31st Millennium and the once great Imperium of man has been shattered in two. The once loyal Warmaster Horus Lupercal has rebelled against his father, the Emperor of Mankind and so begins the Horus Heresy. As ships from both sides in this bloody civil war are torn from the Immaterium above the capital world of Aurora Primus, all sides of the conflicts are alerted to each other; bridge claxons wail as assault pods, lance and torpedo fire is exchanged. Navigators on both sides speak of an ancient and horrible source of power on the planet’s surface below. A haunting voice that will draw both sides into battle to claim this prize. The Traitor forces of the Warmaster know they must secure this potential relic in order to crush the lapdogs of the Emperor in the name of Horus. The Loyal forces of the Emperor know that the traitors must be denied their prize as well as suffer death for their betrayal of the Master of Mankind. A force of shattered legions appear from the void of space using Raven Guard Stealth Technology. A boarding force consisting of a mix of Legionaries from both Traitor and Loyalist Legions. The Thousand Sons ship is boarded as the two sides begin a vicious firefight in the corridors of the Strike Cruiser "Prospero's Hand". The Shattered Legion Commander led his assault from the front, crashing into the enemy at the head of his terminator force. 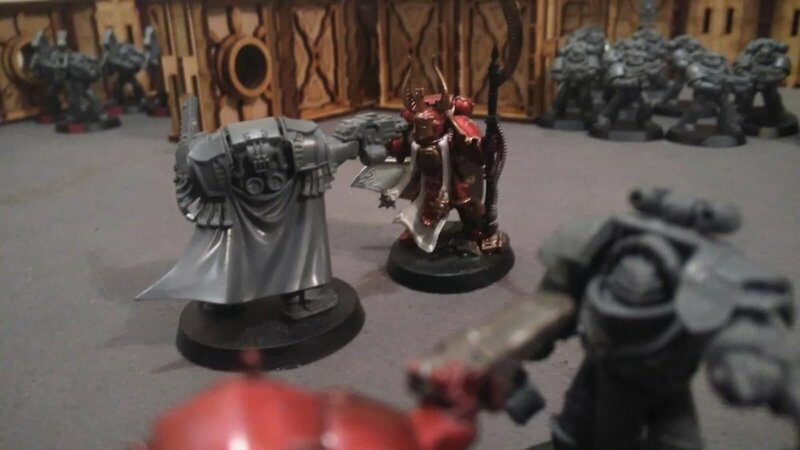 While the Thousand Son's counter attack was brutal and drove back the Shattered Legionaries, the survivors spoke about the duel of their leaders, the Shattered Legion Commander cried "DEATH TO ALL TRAITORS" as he gunned his chainfist and mowed down the Thousand Son's Commander. In the opening hours of the War for Aurora Primus, the Imperial Fists launched a diversionary strike against the Traitor Mechanicum’s Flagship. In the bowels of the Martian Ship the attacking Imperial Fists were pushed back and routed by an unrelenting force of Thallax and Automata under the Archmagos Prime Malagra Zagreus Corvile. The Iron Warriors under Warsmith Verok repel an assault on their engine room by a frenzied force of World Eaters whose boarding torpedo had missed and impacted an Iron Warriors Grand cruiser. In the ensuing chaos, both Traitor and Loyalist forces begin landing forces for the upcoming ground forces. As both the Iron Warriors and Imperial Fists begin to fortify their side’s landing zones, the factions begin the War for Aurora Primus. Big Battles will be next week - first battle should be for the Allaghot Wastes! The quiet among the dead plains in the Alloghot Wastes was disturbed violently by the thunderous clap of a mighty cannonade. The Alpha Legion, a force known for dubious actions and deep complex plans among the forces of the Imperium launch an ambush assault upon the 57th Ashen Scorpions in an attempt to throw their forces into disarray with a decapitation strike. The Ashen Scorpions were quick to act, securing their flanks and firing barrages of heavy artillery followed by Volkite fire and assault charges. The Alpha Legion were only able to claim three of the Ashen Scorpions vehicles, including the Lord Marshall Zacharias Ilsade’s personal Dracosan tank. Rumours after the battle speak of oddities such as a pair of terminators being crushed under the treads of a Malcador tank. As the Lord Marshall inspected the remains of one such group of traitor Astartes, he wondered to himself if they had truly won this battle or if it was just a part in one of the Alpha Legions insidious plots. In an underground complex that ran under the Allaghot wastes, forces of the Shattered Legions infiltrate a underground base garrisoned by a reserve force of World Eaters. 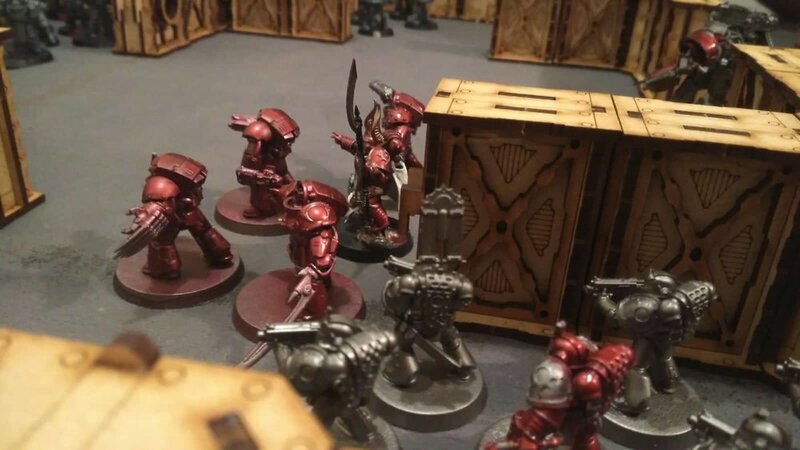 While the Shattered Legionnaires had expected to fight blood thirsty Astartes, they did not expect to be set upon by a squad of the Infamous RED BUTCHERS. The mentally broken but rage fuelled Red Butchers howled cries of anger, hatred and the lust to kill. KILL. KILL as they tore into the shattered legionnaires with the fury of a mighty Chainaxe, wiping out the small taskforce in a depraved act of butchery. The week began with a sudden assault on a Mechanicum force moving through Hive Secundus in the Portion Uplands from an Unexpected enemy, the Alpha Legion! The unrelenting legions of the Mechanicum Taghmata turned and engaged their 20th legion foes. A Squad of Elite Myrmidon Destructors fell under weight of fire before the rest of the Taghmata force eliminated the Alpha Legion Attackers. The Imperial fists fought a desperate close quarter battle against a marauding force of World Eaters. The twisting labyrinth deep in the hive city. The fighting was fierce between the roar of co-ordinated bolter fire and the screeching of Chainaxe and Chainblade. It was only through sheer grit and good fortune that the shield wall of the Imperial Fists was able to hold back the onslaught and drive the World Eaters back. 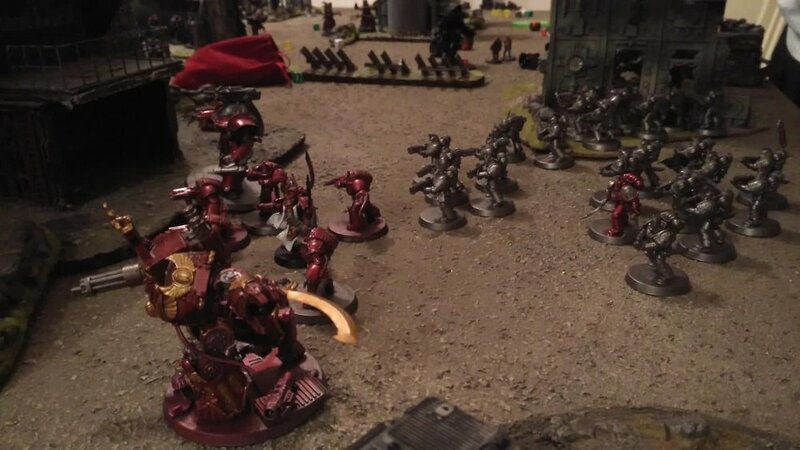 On the western coast of the Hive City, the 57th Ashen Scorpions dispatched a task force to assault a force of Thousand Sons marines. The Thousand Sons endured fierce volleys of heavy cannon fire alongside a follow up spearhead assault. The Thousand Sons were able to hold their ground against the crushing attacks and occupy the strategic targets needed; loses and failure to break their enemy, the 57th Ashen Scorpions fell back to regroup for the next battle. In the south on the border the Iron Warriors assaulted an outpost guarded by a force of Shattered Legionnaires. The Shattered Force, mostly made of marines from Traitor Legions, were holding out as best they could against the amassed phosphex and rocket barrages from the Iron Warriors, all would seem lost until a great sandstorm cut the battle short forcing both factions back into sheltered locations. Losses in the previous battles has led to the Loyalists only able to field a handful of defenders over the Aurora Spaceport. Knowing this part of the War had gone badly, they decided to pull back and allowed themselves some respite for the coming weeks. The 57th Ashen Scorpions attempted to brunt the attack of the Mechanicum with a brutal forward armoured assault with artillery support against the Mechanicum’s front line. The line held, until a Domitar Automata ploughed into the front of the leading Malcador tank and crushed it with its Graviton Hammers. While the heavy guns of the Ashen Scorpions inflicted some casualties, their Lord Marshall knew when to attack and when to withdraw and withdraw he did. 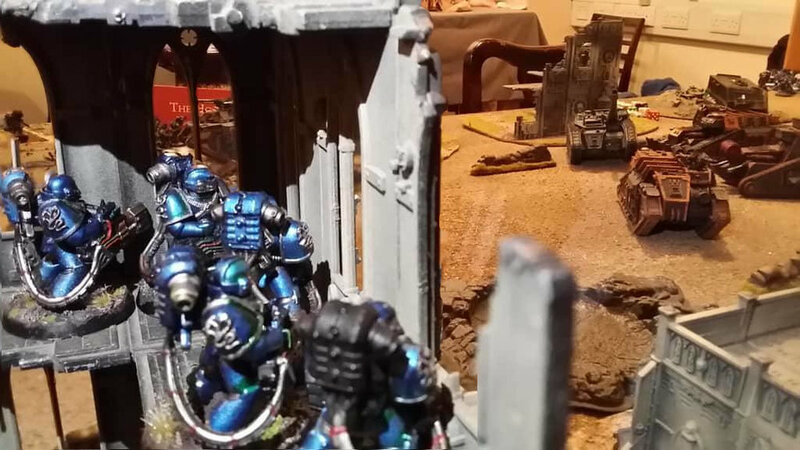 The forces of the Shattered Legions attempted to launch a strike from beneath the underground maintenance tunnels but were set upon by a force of the Alpha Legion! Shots ring out as Alpha Legion Seekers selectively pick off targets from the various Squads, soon backed up by support from a Dreadnought. Though they were fought off and crushed, the taint of the Alpha Legion’s treacherousness lurks in the air. The Imperial Fists took to the field in an attempt to help gain ground, however due to the informed warfare of the Alpha Legion they suffered heavily from artillery tank strikes which killed score of Imperial Fists marines before they tactically withdrew. While they had managed to gain some footing, the concentrated fire was too much even for the stoic 7th legion. In the deep tunnels of the Manufactorum, the Solar Auxilia’s 57th Ashen Scorpions dug in in defence of the maze-like structures. The echoing halls erupt with sound of revving chain-weapons and the pounding of heavy footsteps as the World Eaters emerged from the darkness to kill. While several members of the Auxilia died horribly, they quickly regrouped, bringing rapier batteries to bare on their attacks and inflicting devastating casualties; holding their ground and winning the day. The Mechanicum repelled an attack against a force of Shattered Legions, holding back and allowing them to come into the open to be killed with overwhelming firepower. The Loyalists war effort has been broken and they, outnumbered and outmanoeuvred, could not hope to stop the Traitor war machine from grinding them under its tracks. On the 7th week of the campaign, the Forces of the Warmaster had finally pinpointed the location of the Loyalists greatest stronghold on the planet and an all-out assault was planned to finally crush the Loyalist forces. 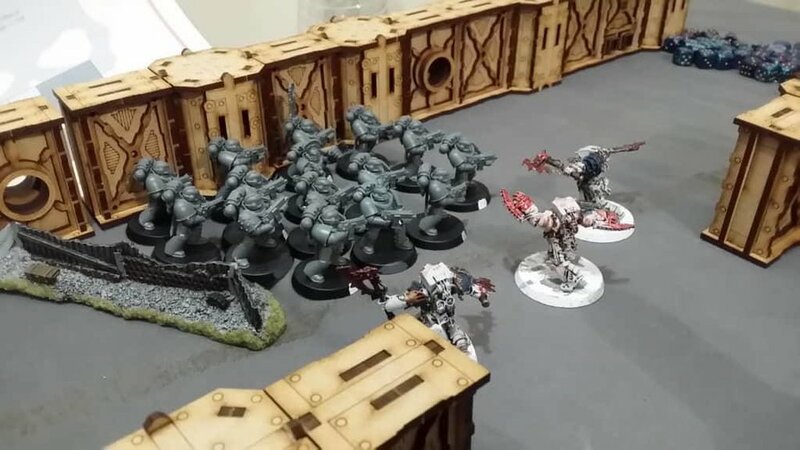 The Traitor forces had sent scouts to recon the area, finding it only accessible by two entryways in the valley, knowing this, they set a plan to have the savage World Eaters assault from the east supported by the near indominable forces of the Mechanicum with tactical command placed in the mechanical hands of Archmagos Prime Malagra Zagreus Corvile. The West would be the spearheaded by the Thousand Son’s Magister Akhmenhotep commanding the western forces with support from the Alpha Legion. Magister Akmenhotep would say "The pitiful lapdogs of the treacherous Emperor shall be erased from history this day!" before embarking upon his spartan assault tank with his elite Sekhmet Terminator body guards. 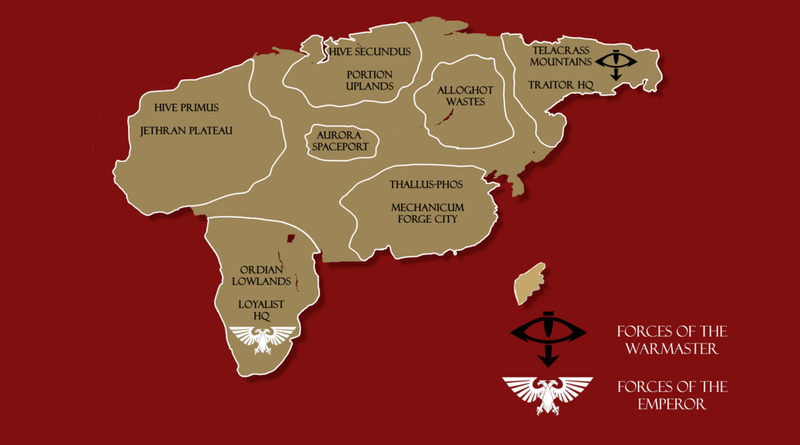 The traitors coordinated assault soon began, the Mechanicum and World Eaters from the east and the Thousand Sons and Alpha Legion from the west. The Solar Auxilia unleashed a furious cannonade of artillery and heavy cannon fire, blitzing the advancing World Eaters. The Thousand Sons would lose their spearhead vehicle to the strafing run of a Primus Strike Fighter; itself not lasting long under the focused cannon fire from a Leviathan Dreadnought. The traitor Mechanicum forces advanced under the combined fire from the Solar Auxilia and the Imperial Fists. The unrelenting cyborgs of the Thallax shrugged off wounds that would fell lesser men and even some Astartes. The east flank erupted with a mighty BOOM as a World Eater Baneblade tank was brought low by focused anti-tank fire; but not before it inflicted critical damage to the loyalist’s main fortification, opening the way for the Mechanicum and the Thousand Sons to annihilate the mighty fortress. Alpha Legion saboteurs would sneak their way into their enemy’s lines and inflict heavy damage to the fortress. The roaring cannons, the slaughter at the barricades and the destruction of the Loyalist HQ spelled the end for the Emperors loyal warriors as their position was overrun. The World Eaters would lose their mind to the Butchers Nails and assault their own allies out of desperation to ease their mental agony. No matter how many they killed, the loyalists could not hold their ground and would be overrun.